Giant pandas are found only in the temperate forests of China. 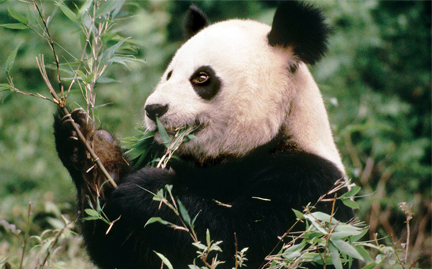 Although classified as a carnivore, the panda’s diet consists almost exclusively of bamboo. Despite being one of the most popular animals in the world, giant pandas are threatened by habitat fragmentation and unsustainable development. It is estimated that 1,800 pandas remain in the wild.